Biassa is located along the coastal road that leads to Cinque Terre. This area is rich in history, and was first mentioned in the 13th century under the name of �comunitas Blaxiae�. Both Coderone Castle and the church of Santa Maria Maddalena also date back to the 13th century. Today, both structures lie in ruins, but it is thought that the castle was originally erected to defend Biassa from the Pisans, who had settled in the neighbouring town of Carpena. The community of Biassa was made up of people from the slopes of the nearby mounts Verrucoli and Parodi. The ancient town was formerly the centre of the parish of San Martino. Carpena separated itself from this parish at the end of the 13th century, becoming a parish in itself. Unfortunately, this led to the demise of the little village. Over the years, the castle�s defensive function became obsolete, and the construction fell into disuse. The inhabitants who had set up home in and around the castle grounds moved further down the valley, to form the town of Biassa. The economic survival of the town was based on the cultivation of the Tramonti vineyards, which were planted on the western side of the hill. In the 19th century, the town was also able to develop its mining industry, thanks to the demand for building materials needed to construct the various military structures that have sprung up in the Spezian Gulf over the years. 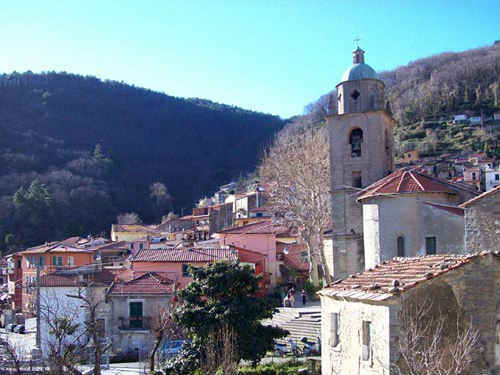 Today, the town of Biassa is built up around the Romanesque church of San Martino. The houses are built one of top of the other, and are adorned with picturesque sandstone doorways. The Bassia territory comprises a number of little seaside retreats, known collectively as Tramonti. The easiest way to access these hidden beauty spots is by boat, although those wanting a challenge could also go by foot. Boat trips set off from Portovenere, passing by the Byron Grotto, the Black Rock of Muzzerone and the red rocks of Albana before making their first stop at the rocky beach of Persico. The journey then continues on past Navone, the Rock of Gaiada, Schiara and the little church of Sant�Antonio, Monesteroli and the enormous Montonao rock and the beach of Nacche. Fossola, with its little church dedicated to the Angelo Custode and La Pineda, with its pebble beach are the last two stops before entering into Riomaggiore territory. For hiking lovers, Schiara and Monesteroli are accessible by taking the road leading from Biassa towards Monte Parodi. The walk takes you past an outdoor training course, a little church and a Neapolitan fountain known as Nozzano. The dolmen di Tramonti is said to be located nearby.